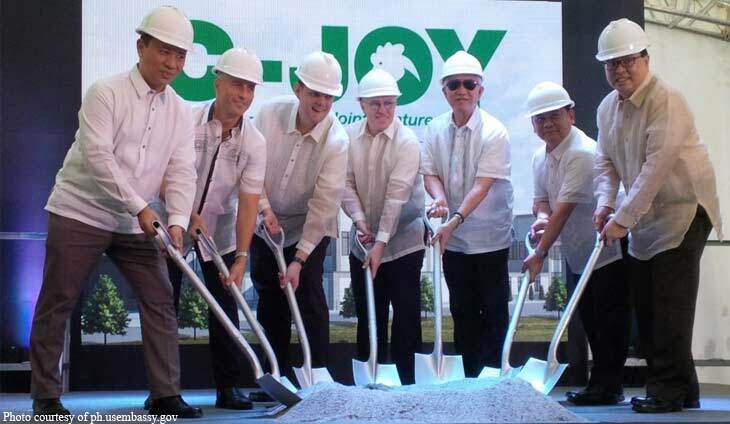 Cargill Joy Poultry Meats Production Inc., a joint venture between Cargill and fastfood giant Jollibee Foods Corp., on Tueday inaugurated its new poultry processing plant in Sto. Tomas, Batangas. With a production capacity of 45 million chickens per year, the plant is said to be the largest in the country. It provides dressed and marinated chicken to meet the increased demand at JFC brands. C-Joy has partnered with farmers in Batangas and nearby provinces to supply chickens to the new facility. ?We are bringing protein to family?s tables across the Philippines. Cargill and Jollibee came together to start this plant because of our common commitment to the highest standards in product quality and food safety. This is reflected in this new plant which harnesses technology and global experience to deliver tasty chicken products in an environment which is safe for our employees and is environmentally sustainable,? said Paul Fullbright, president and CEO of C-Joy. For his part, JFC chief executive officer Ernesto Tanmantiong said: ?We partnerd with Cargill to deliver high quality chicken products through Cargill?s technology and quality standards.? Cargill provides food, agriculture, financial and industrial products and services to the world. It has 155,000 employees in 709 countries who are committed to feeding the world in a responsible way, reducing environmental impact. JFC, meanwhile, is the largest Asian food service company with over 3,600 stores in 16 countries with seven wholly-owned brands (Jollibee, Greenwich, Chowking, Red Ribbon, Mang Inasal, Yonghe King and Ho ng Zhuang Yuan).